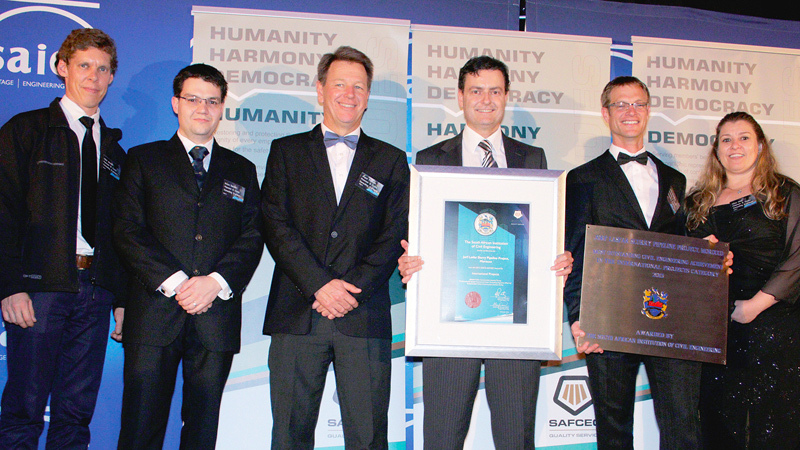 The Cape Town office of Paterson & Cooke, a global specialist engineering consultancy, was presented with the award for BEST INTERNATIONAL PROJECT at the recent SAICE – SAFCEC awards ceremony held at the Bay Hotel in Cape Town on 8 October 2015 for the Khouribga to Jorf Lasfar Phosphate Slurry Pipeline in Morocco. The award was accepted by Project Manager, Julian Rusconi, Director, Angus Paterson as well as key members of the project team. Julian thanked the organizers and paid tribute to his team members who had dedicated themselves to ensuring the success of the challenging project. The project consists of a network of slurry pipelines which transport milled phosphate rock from the mining areas near Khouribga in Morocco to the port and chemical processing facility located at Jorf Lasfar, nearly 200km away. It is one of the world’s largest slurry pipelines, the main section of which has a diameter of 900mm, is 187km long and is able to transport 4400 dry tonnes per hour of phosphate. The product stored at the head station of this main pipeline varies in grade and quality and is stored in separate agitated storage each with a volume of 5000 m3. As these various batches of phosphate slurry arrive at the terminal station they are diverted to dedicated storage tanks that feed separate process streams in the chemical refinery. This means that the pipeline design needs to accommodate the pipeline transport requirements of the different batches and be able to identify where these batches are during transport so as to ensure they are allocated to the appropriate tanks. As the batches are intermittent and have variable flow properties the pipeline design needs to accommodate a wide range of operating conditions. This is achieved by varying the pumping head and through a series of pressure monitoring stations and a choke station at the terminal. The system is monitored and controlled from a central control room. Due to the scale of the project the system includes some of the largest slurry handling equipment yet produced and this presented many unique challenges to the engineering team that required an innovative approach to solving the unique problems. The project has helped to cement Paterson & Cooke’s reputation as a leading provider of slurry transport systems and mineral processing solutions. Formed in 1991, Paterson & Cooke now has offices in Calgary, Cape Town, Cornwall, Denver, Johannesburg, Lima, Perth, Santiago, Sudbury and Vancouver. Julian is an experienced engineering manager. 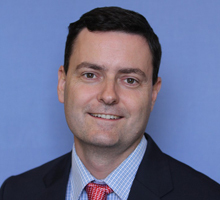 He held key positions at various manufacturers of industrial automated machinery and worked for Dow Chemical before joining Paterson & Cooke in 2005 where he currently manages the engineering of major slurry pipeline projects.